Elkhart, Ind. – According to Statistical Surveys, a revitalization in retail sales for Toy Haulers has created many new options for those searching for an RV with garage capabilities. 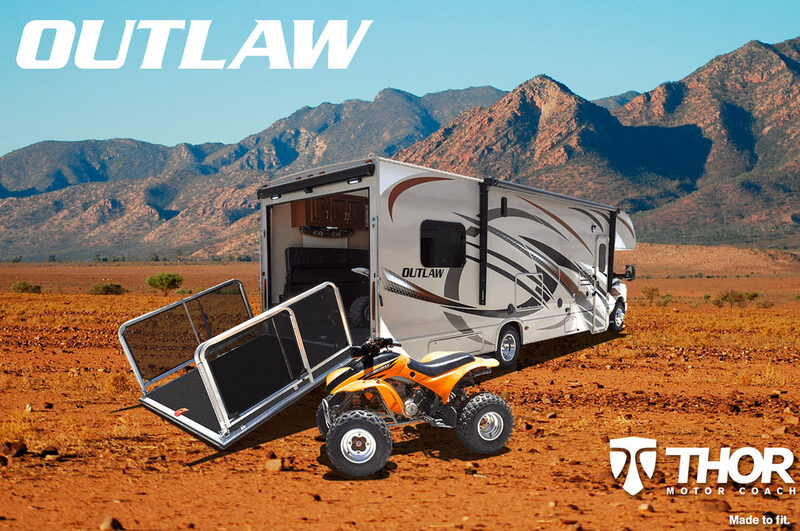 Thor Motor Coach (TMC) continues to drive sales with its motorized toy hauler, the Outlaw. Expanding its claim as the ultimate residential motorhome, TMC has recently released new floor plans and valuable camper conveniences aimed to fit today’s busy lifestyles. A new 37RB extends the Outlaw Toy Hauler’s desirability by adding a second slideout with a permanent Denver Mattress® queen size bed. This dedicated bedroom provides a good night’s sleep and privacy from other guests towards the front of the coach and even from those up in the loft bedroom. Now the kids can have their space, while mom and dad get a bed that no longer has to be converted to sleep. This 37RB version keeps all the amenities of a traditional Class A motorhome, with the highly sought after garage in the rear. Known as the “Ultimate Tailgating Partner”, the “residential edition” 38RE definitely fits into a very unique category with an ultramodern bedroom featuring 9-foot coffered ceilings where the garage is customarily located. The 38RE was awarded the 2015 Top RV Debut by RVBusiness© and after taking a closer look, you can understand why. It has an immense living area, perfect for traveling and relaxing. 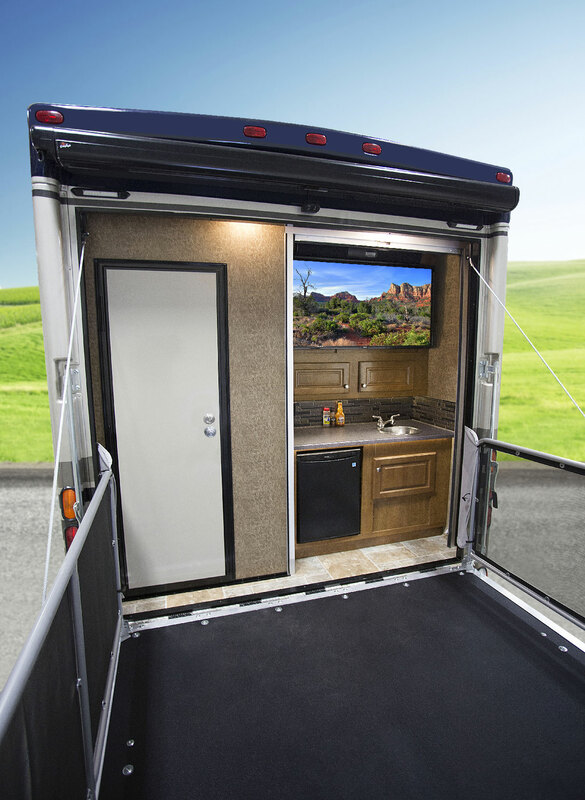 The inventive rear “Patio Deck” folds down to reveal the best entertaining option in the market with an exterior kitchenette, 50-inch big screen TV, and Bluetooth radio. 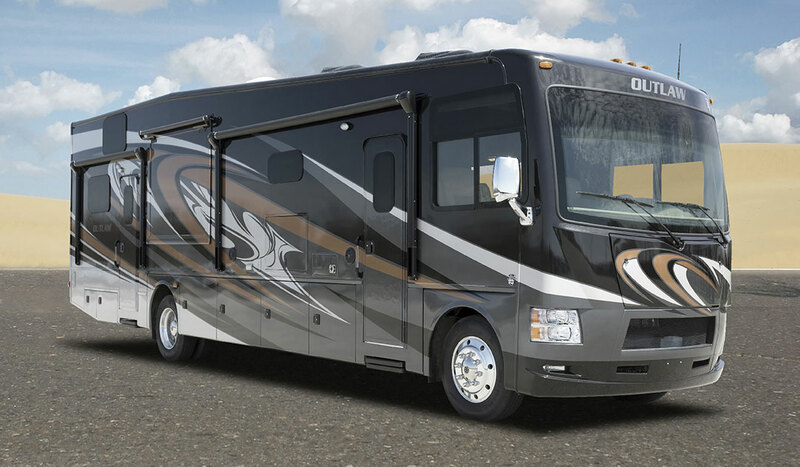 Whether you are interested in the Class C 29H Toy Haulers or any of the Class A Outlaw RVs, you will find Thor Motor Coach’s Rapid Camp® on all units. Rapid Camp is a wireless control system allowing owners to set up camp quickly at a distance of up to fifty feet away from the motorhome. Features that can be operated include the leveling jacks, slideouts, generator, patio awning and patio light. 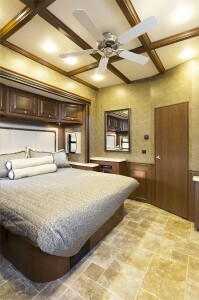 All Outlaw toy haulers and motorhomes include an overhead bunk in the cockpit area with Class A units featuring an electric drop-down version of the bunk. When lowered, the bunk provides a comfortable sleeping space for two. When in the raised position, it is camouflaged into the ceiling and a great place to secure personal items while you’re away because it’s operated by a separate key. To find the Outlaw Motorhome that was made to fit you, visit http://OutlawRV.com.